I’m not sure how it came to be, that I learned how to sew. Did I pester my Mom to teach me? What did I think I was going to make on her old Kenmore? I remember she explained it all to me and was very clear about her instructions. She wanted me to pay attention and not ask her to run back to answer questions every 5 minutes, she had other things to do. I took to it, like a fish to water. Soon I was making all kinds of clothes. Most of my babysitting money went towards patterns and fabric at the local Zellers department store. I could get off the bus near to that store. Even though the selection was not great, location was key. It forced me to be creative. I wore clothes in junior high school that nobody else had. At the time, I liked being different. Sewing and clothes would remain a major part of my life right up through high school. Then I took a break for a couple of years. My Mom warned me that would happen. She said that one day I would make enough money that I would buy all my clothes at the store. I couldn’t believe it. Clothes were so expensive in those days and I could use a pattern again and again! My dry spell ended after I quit University and started attending design school. Sewing is a huge part of the curriculum. And I was learning how to draft my own patterns. I was sewing without pins on industrial sewing machines which were so powerful they would sew through your whole hand if you were not careful! This was the real deal. All thanks to my Mother. She knew that University business school was not for me. She helped me convince my Dad that I needed to give my real passion a try. While the technical skill of sewing is incredibly straight forward and by that I mean in a straight line literally, front to back, sewing is not easy. There are twists and turns in every pattern which can throw you for a loop. My Mom was there in the early days to help avert whatever seemingly disastrous mistake was at hand. She was big at saying things like, “good enough” and “no-one can see the inside anyway”. Sage words of advice in sewing and in life. Even in an industrial sewing factory or a high-end couture house in France, there is no such thing as perfection. When I say sewing is not easy, my teacher at Form + Function Design Academy was famous for pointing out that a career built from sewing is a tough choice. “There are easier ways to make a living,” she used to say. Which turned out to be more true for me than she could have ever imagined when teaching that lesson. As I look back on my career in the apparel business, and all the people I have worked with, there is only one person who devoted her life to the art and craft of sewing. Even though she has many accomplishments, her passion was always grounded in sewing. She has used her skills to benefit the lives of countless other women by teaching them how to sew. I feel a deep connection to this, because without that first skill, I can’t imagine what the arc of my life might have been. Sylvia Rempel is the person who showed me what is possible for a woman who knows how to sew. I worked at her company as a kid out of design school, helping out whoever asked me, doing whatever needed to be done. I soaked it all up and learned the business. I was the assistant to Angel Grams, Sylvia’s daughter and between the two of them, I was afforded opportunities unheard of for a young woman in her early twenties. As things go in the apparel industry, circumstances change on a dime. I think only the restaurant business might be more volatile. Particularly back in the 1990’s. The sports apparel sector, which was my niche, was not the big business it is today. By the late 1990’s I was onto my next jobs. Jumps I made along the way to increase my income and gain new experiences. All thanks to the foundation I had established in my learning and skills, which would not have been possible without my big break, working for SunIce. 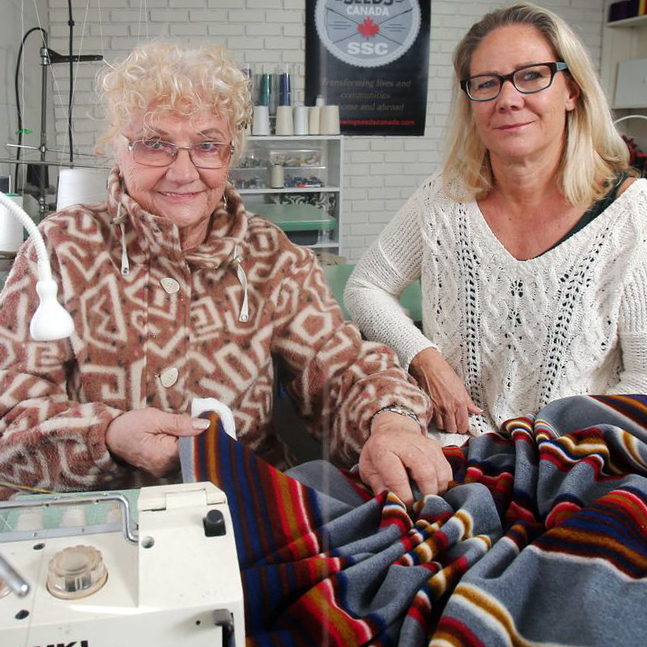 Sylvia Rempel, Founder of Sewing Seeds, embodies the entrepreneurial spirit. A mother, grandmother and great-grandmother, she has overcome hardships. Sylvia arrived in Canada as a non-English speaking immigrant and self-taught seamstress, and went on to build a multi-million-dollar clothing enterprise employing hundreds – Sun Ice. It drew international attention as an official supplier to the 1988 Winter Olympics Games in Calgary, Alberta. Sylvia has gone on to re-define “retirement.” Her new life’s chapter, has drawn on her passion and experience to develop a sewing skills training curriculum that leads students from novice to qualified seamstress. She has transformed lives at home and around the globe. Sylvia is building skills, self-confidence and financial independence in her programs. She is committed to excellence; expecting a high standard of quality and professionalism from students. Sylvia’s latest venture is training sewing teachers to carry on this legacy into the future. As important as the skill of sewing was for me, it was never a necessity as it is for the students of Sewing Seeds. These women really need this opportunity to better themselves, their families and communities. I think it is through programs like this, which focus on helping women, where the biggest social changes will occur. Our future will be better if we help women. The sooner we all realize this, the better. It is with deep appreciation I give thanks to the help I have received from all the women in my life. I would not be who I am without you! As I walk fully into my next chapter, I intend to surround myself with the kind of women who used to be few and far, in-between all the men. It’s time to create the change we want to see in the world! ← Where can you live in the sky with a canopy of trees?